I write to you at 7:30 am on Wednesday morning. In light of Hurricane Lane’s approaching the Hawaiian Islands, I start this week’s letter to you by encouraging prayers for a good outcome as we prepare for the worst and hope for the best. The staff and I will meet at 10:00 this morning (Wednesday, August 22nd) to go over what needs to be done to secure the premises and then go ahead and secure what we can after the 11:30 Eucharist. Ramona made arrangements for Habilitat to come in this morning to sandbag the doorways and close the windows in the sanctuary. Unfortunately, we are not able to put up the window screens as a cherry picker is needed for the west stained glass window and one is not available to us. We will secure computer equipment and unplug electronic equipment to mitigate damage due to power surges. Ramona is making arrangements to have the Diamond Head tent taken down. After the premises are secured this afternoon, I will close the office and cancel all scheduled meetings for Thursday and Friday, including the Worship Committee meeting on Thursday at 5:30 pm and Centering Prayer on Thursday at 5:00 pm. The staff will return to work on Monday morning and I expect to hold all worship services on Saturday at 5:30 pm and Sunday at 7:00 pm, 8:00 am, and 10:30 am. Please hunker down and stay safe over the next couple of days. I will keep you all in my prayers and I ask you to keep me in yours. The Cathedral Chapter met yesterday evening and approved the July 2018 minutes and accepted the financial statements and Treasurer’s Report, subject to audit. These have been posted on the web site for your review and ready reference. Plans are still in place for Fr. 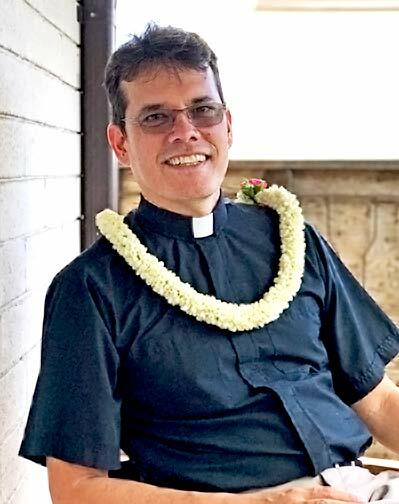 Keleawe and me to attend the annual clergy retreat on Maui this coming Monday, Tuesday and Wednesday. The Wednesday Eucharist on August 29th at 11:30 will be cancelled as clergy, including supply clergy, will be at the retreat. My apologies. This morning’s Wednesday Eucharist (August 22nd) will be held. We had a beautiful service to honor Prince Albert this past Sunday and the Royal Civic Societies were with us at 8:00. We had the privilege of Victor Young’s playing the organ for us at 8:00 and 10:30, which was an added treat. Finally, please remember the contemplative prayer session that I will offer on Thursday, August 30th at 6:00 pm in the Cathedral Manger. Please let me know by Tuesday, August 28 if you would like to attend so that I have an accurate count for the Portuguese bean soup. Again, I close with prayers for us as Hurricane Lane makes it way toward the Hawaiian Islands. Please take care. Fr. Moki’s past messages are available here, and his sermons are here.